I PUT ALOT OF EFFORT & TIME INTO THIS PIC SO PLEASE PLZ COMMENT & VOTE DON'T JUST VIEW!! I USED A PICTURE FOR REFERENCE ON THE POSE NOT COLOR AND I GIVE CREDIT TO THE ORIGINAL ARTIST WHO DREW THE FIRST PICTURE OF DARK IN THIS POSE! But I drew and colored it myself... This is Phantom Thief Dark's award for being a first place winner!! XP I love this picture.... It is Dark in all his sexiness!! 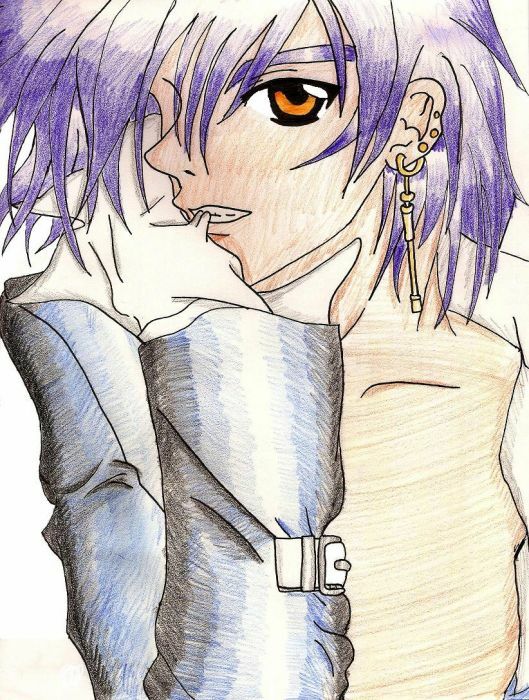 LOL Well I hope you all like my picture... LOL ~Yume~ TLJ Media Mechanical Pencil .7 mm Sakura Micron Pen .7 mm Crayola Coloring pencils Shading/Highlights Hard and soft shading Normal Highlighting Time 4 hours Sketch 2 hours 50 minutes Outlining off/on 1 hour Coloring 10 minutes I put a lot of effort in to this picture so please comment and vote! !